My grandfather was born in Sprang-Capelle and at the age of 7 he lost his father, leaving the widow and children in very poor circumstances. My grandmother was born in Dordrecht as an only daughter with several brothers and was a bit spoiled. During World War I my grandfather was stationed as a soldier in Dordrecht. There he met Willie Zijderveld. They were married there on March 29, 1917. 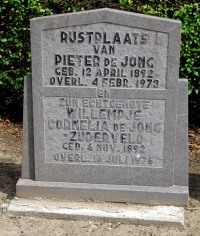 Five moths later their first child, Pieternella [Nel], was born. My grandmother was 10 times pregnant, including a miscarriage and twins. Around 1930 my grandparents moved from Sprang-Capelle to Mookhook on the Hoeksche Waard island in search for a job. There, my grandfather started working as a farmhand. During the Great Depression of the 1930s my grandfather wasn't always paid his full salary, while he had a wife and 10 children to feed. In the last year of World War II the allied soldiers had liberated Brabant, while the Hoeksche Waard, where my grandparents were living, was still occupied by the Germans. During the winter of '44-'45 the area was regularly bombed. One of my mother's brothers was wounded, but they all survived the war. After the war my grandfather and his sons started working in construction. The whole family was thrown out of their home by his former employer, and my grandfather had to sue him to receive at least some of his back wages. The family lived in the local community building for a short while until some new houses were finished and they got to rent one of them. Trouble wasn't over yet. On January 31, 1953, during a heavy storm a huge flood broke several dikes in the Hoeksche Waard. My grandparent's house was flooded, too, and they stayed at the attic with their two youngest daughters, one of them my mother. On February 2 they were rescued.